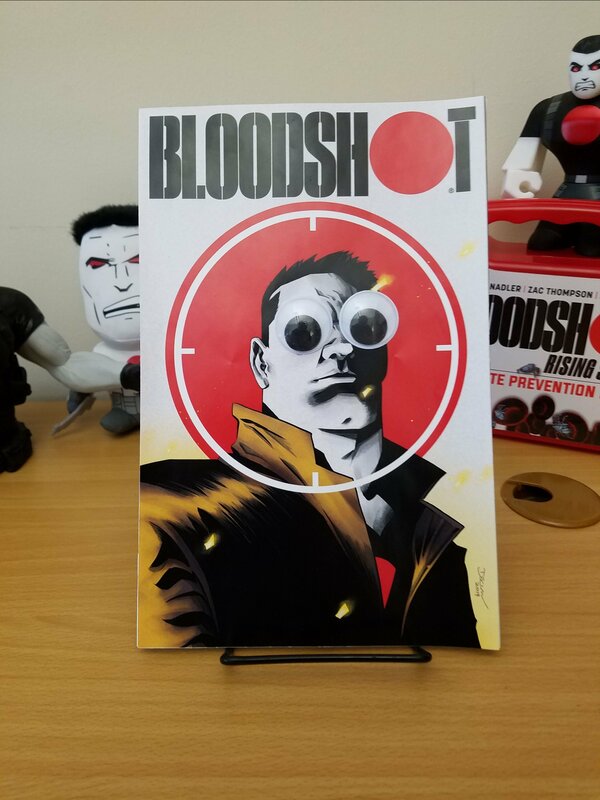 New York, NY (April 1, 2019) – Valiant Entertainment is beyond excited to reveal the first look at the BLOODSHOT #1 Googly-Eyes Variant, which features an eye-popping cover image by Declan Shalvey and an extra special Googly-Eyes treatment from Michaels, the premier source for art supplies, crafting, and framing! SYNOPSIS: When a monster rises from the Pacific, Hollywood’s greatest action heroes join forces to fight it. But even their combined awesomeness is not enough. Can the Monster Matador arrive in time to help? The epic Battle for Santa Monica begins here! STORY: So I really like the concept of this book, but I do have to say that the dialog and writing lose me. There is a string of random movie references that have no real bearing on the story. They seem forced in because the writer needed to make reference to some of his favorite movies. The story is sort of all over the place. The story seems rushed in spots to fit within the book and doesn’t really build out the world in which things are happening.